My husband thinks soup is a waste of time. Poor, misguided soul that he is…I still love him. Even thought it means I don’t eat soup as often as I’d like. But today, with somewhere between 7-10 inches of heavy, wet snow in the forecast…well, I wanted some hot, comforting, soul-soothing soup for lunch. With a grilled cheese sandwich. 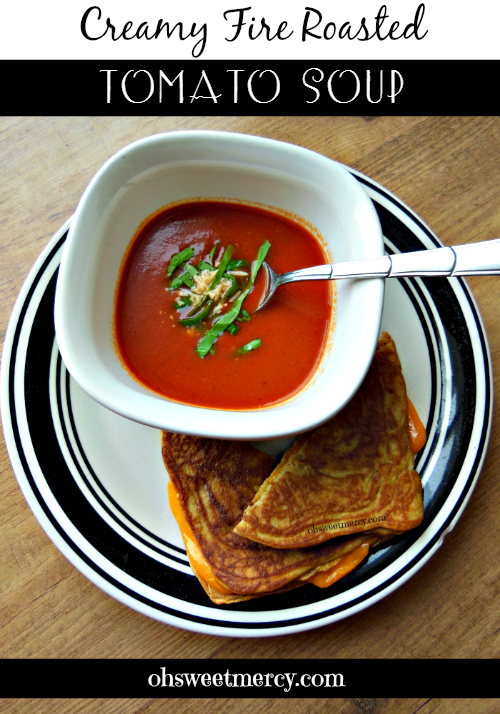 What else could I do but throw together this Creamy Fire Roasted Tomato Soup and pair it with my favorite onion & curry seasoned Coconut Flour Flatbread? 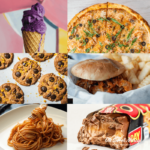 It took me back to my childhood…but with a bit of gourmet flair. I have very fond memories of a very famous red-and-white labeled can of tomato soup and grilled cheese sandwiches as a kid in the 70s and 80s. But, what I had today was warm, creamy tomato-ness with the deep flavors of fire roasted tomatoes. 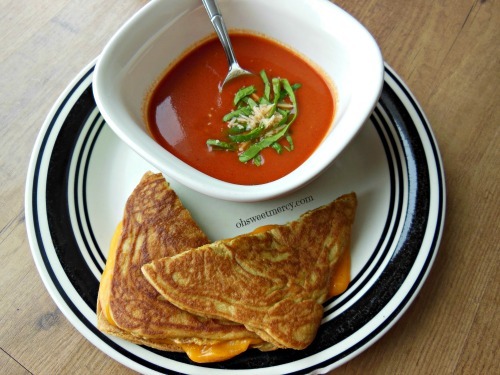 Gooey grilled cheese made with cheddar, on a flavorful low carb bread. This soup and sandwich combo is modern and nostalgic the same time. Modernstalgic. You heard it here first folks. I’d found some cans of organic, fire roasted tomatoes at my local Aldi store for just twenty-five cents, so I grabbed a couple. I love a chunky soup as well as a smooth and creamy one, so it would be good either way. Today however, nostalgia demanded smooth and creamy. Ideally, I would have canned my own fire roasted tomatoes last summer. Realistically, I buy them. We were observing the shmitta year, so no garden was planted to let the land rest. I’ll be planting tomatoes this year and fire roasted tomatoes are on my list of things to can. Fire-roasting tomatoes gives them a depth of flavor lacking in regular tomatoes, plus just the slightest smoky hint. Once you try them, you’ll never want regular old tomatoes again. In the absence of my own home canned produce, at least these were organic. I do the best I can with what I have, which is still better than a can of commercially prepared soup. Those soups often have far more sodium than necessary as well as other undesirable ingredients, so making your own when you are able is always better, even if you don’t have organic ingredients. This delicious soup was ready and served steaming hot in just a few minutes. You can let it simmer as long as you like of course, but just a few minutes is really all that’s needed once you get everything in the pot. Which takes all of like two minutes maybe. I added gelatin for a little extra protein and to give it a creamier texture, since I didn’t have any heavy whipping cream on hand and didn’t want to add too many extra carbs by using a lot of half and half. It would be delicious with some basil added too, but the kids didn’t want basil. Trim Healthy Mamas, this can be eaten in any setting. Be sure to include some extra protein! 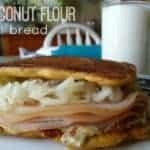 My grilled cheese on coconut flour flatbread meant my lunch today was an S.
For an E meal, I could leave out the butter and half and half and have a sandwich on plan-approved sprouted bread with lean meat, fresh spinach, mustard and a bit of light mayo (5 g fat or less per serving). For a Fuel Pull, Wonder Wraps (pg 274 in the original plan book or pg 204 in the new cookbook) with very lean meat, veggies and mustard would make a great side. The soup itself contains your limit for added fat and carbs made as is. 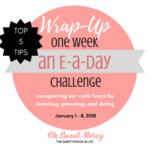 You could also make the soup E style and have more wiggle room for your fats to add a bit of light mayo or cheese to your Wonder Wraps. With any of these styles, a big dark, leafy green salad with the appropriate on-plan dressing would also be a great addition. I often use fresh lemon juice or raw ACV as dressing for my E and FP salads. And lately, the pickling liquid from my Easy Pickled Onions recipe is my favorite salad dressing! 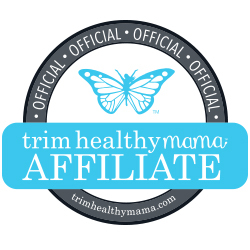 Wondering what all this Trim Healthy Mama, S, E and FP stuff is all about? 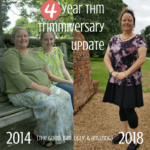 See what it’s done for me in this post. 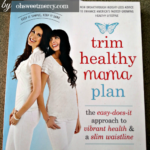 Order the NEW and improved plan book here. Let’s make some creamy, fire roasted tomato soup! This easy soup beats canned, supermarket soups any day. A grown-up take on a nostalgic childhood favorite that you can make to suit any THM fuel style. 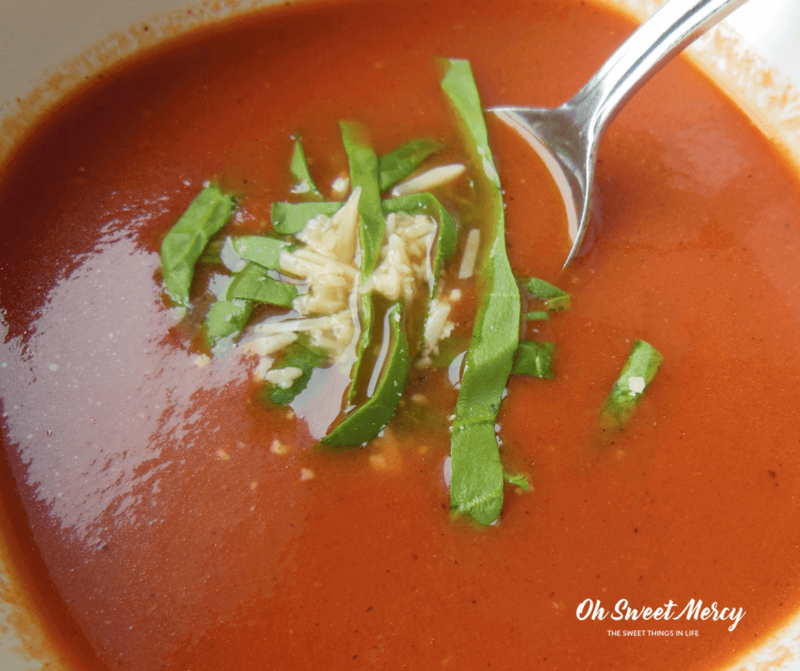 Be Sure to Pin This Creamy Fire Roasted Tomato Soup Recipe to Your Favorite Pinterest Boards! Love a recipe that uses both broth AND gelatin! I need to make this before the weather warms up here. Thanks for sharing. 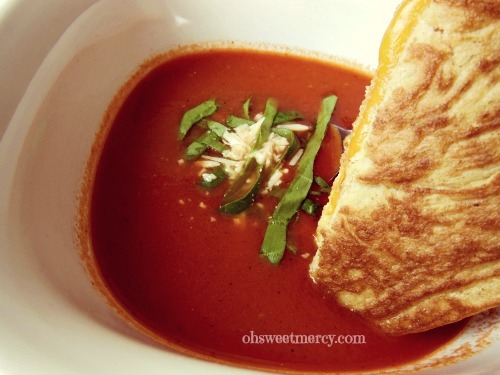 Grilled cheese and tomato soup – that brings back lots of memories! Using fire-roasted tomatoes sounds amazing!!! Yum, I love tomato soup! I’ve never used fire roasted tomatoes and balsamic vinegar before in my soup. Great idea! I may have to try it next time.